The kitchenettes depart from the concept of integration between the environments of the house. It is a solution adopted to connect the kitchen to the dining room or to the living room and it may be even used in homes and apartment without walls . 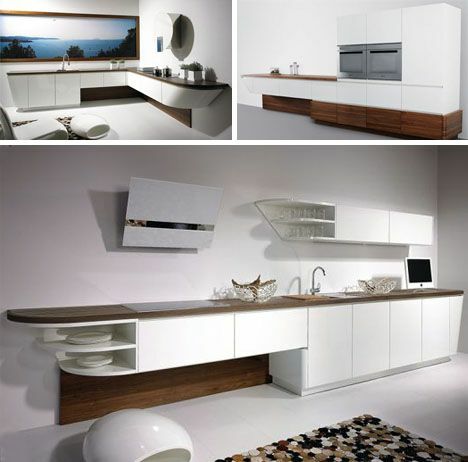 “Today, this style of kitchen is preferred by 85% of consumers, while in 2007 the search was only 30%”, Felipe Garcia said, a product development manager for Living builder. 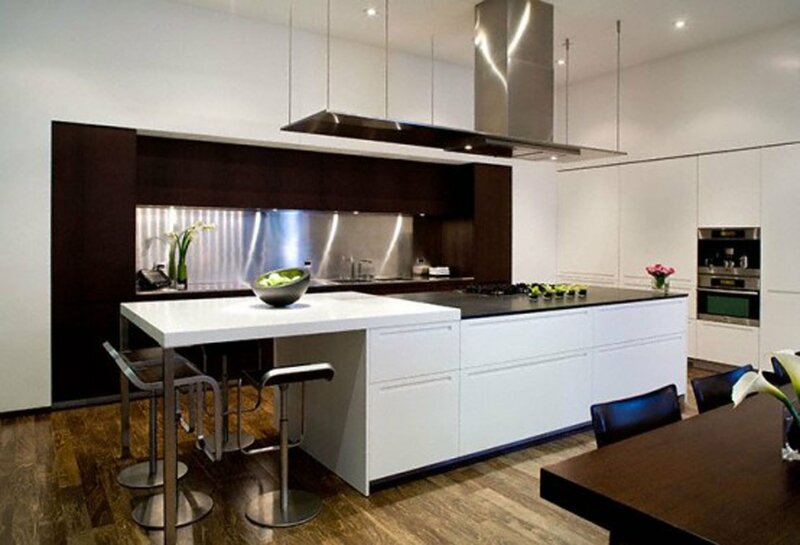 The kitchen is characterized by using a half wall or a bench to separate from the surrounding environment. According to this central idea, architects and designers develop new techniques and trends to enrich the environment and its characteristics. By integrating the other rooms, the kitchen brings a roomy feeling of space and creates common environments. 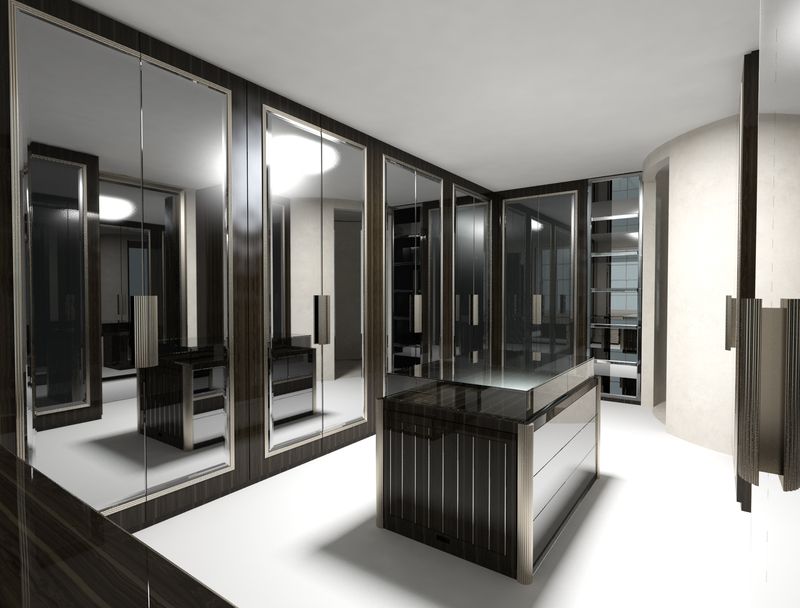 Moreover, the dynamics of the house becomes simpler, and interactive practice due to one or more rooms now are united. As a result, the half-wall (or its non-presence) appears gradually, which will allow the integration and interaction, and this acquires new functions. On the other hand, there are some issues that can be seen as disadvantages. Since the kitchen is integrated with other different environments on purposes, the preparation of food and meals can generate strong odors and make your own environment full of the odors. But it is clear that there is a solution to this. Keep reading to learn. Another problem is that the kitchen will generate more dirt depending on stove used, such as splash of fat. And here is the same as the previous one: the dirt is no longer restricted to just stay in the kitchen. As already mentioned, the bench comes as an element that integrates and brings interaction to the kitchen and the environment next to the bench. It can and should be explored thoroughly. It is an element that becomes functional and aesthetic fully. It is also a part of this kind of decor and style, as the material is chosen for using in the surface, generally which must match the cabinets and other objects of the room. 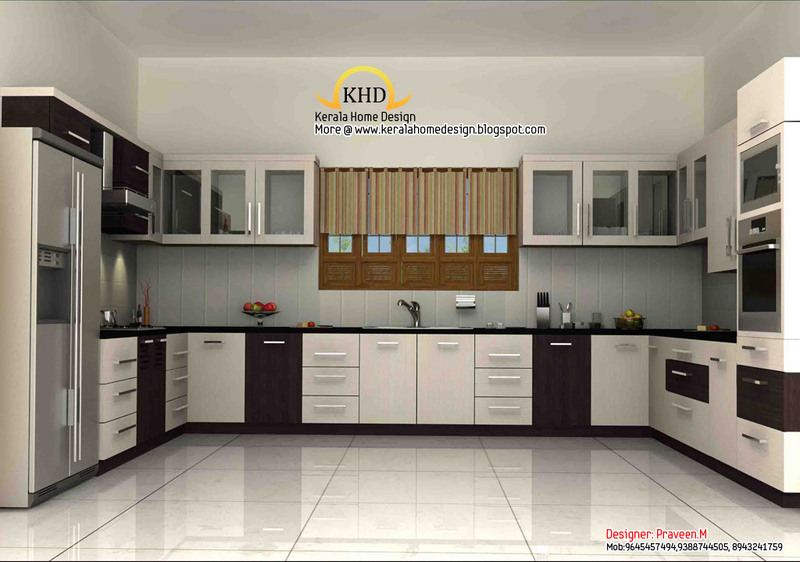 The webpage has prepared 41 inspirations of ideas and information materials for kitchen counter tops. In addition to choosing the style of the bench, it is essential that the model works well with the extension of the kitchen space, with planning how many people should be accommodated there and still think of your decor. Thus, the counter appears as a multi-purpose element is for dining and cocktails, a space for stove and preparing meals and a place for people to sit and interact with food prepared there on the side which also has other functions. The operation of the kitchen should be fully planned and this is reflected in the environmental dynamics and selection of elements present there. Check out some tips. 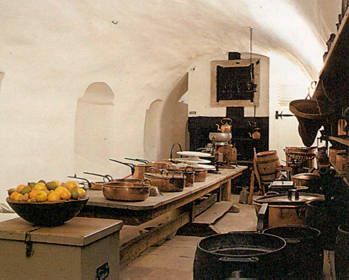 Plan the kitchen according to the items used in day-to-day and the food preparation time which are points of practicality and simplicity. To prevent the smell of food preparation from leaking into other environments, a powerful hood becomes necessary. Although the kitchen is an integrated environment, some customers choose to the solution that might give a certain division, but not completely, of course. This may come in a sliding door, which allows moments of partitions of privacy or other materials. The table can exist in integrated dining room in the kitchen, but it also can exist from the original furniture. That is, the counter turns into a dining table. In this case, the table must have a height less than the common counter. This option is feasible especially for small apartments and kitchens. A bench or an integrated table requires great chairs. In the case where asks for banquettes, chairs should be high and proportional to the counter size. Since the American style appears to integrate the kitchen to other environments, a factor that helps in this mission is the choice of floors. It is recommended that the material is the same in integrated environments, giving a sense of continuity that this room do not end there. But, instead, the wall has no such obligation. Some wall clocks are suitable and are recommended as a decor for kitchen because decorating with timepieces has a more complex cleaning, while others are preferred, such as wall stickers. Generally the counter requires a special light to the actions, such as food preparation which may occur there. So, do not rely solely on the source of light coming from the kitchen. Pendant luminaires are a great option in this case. 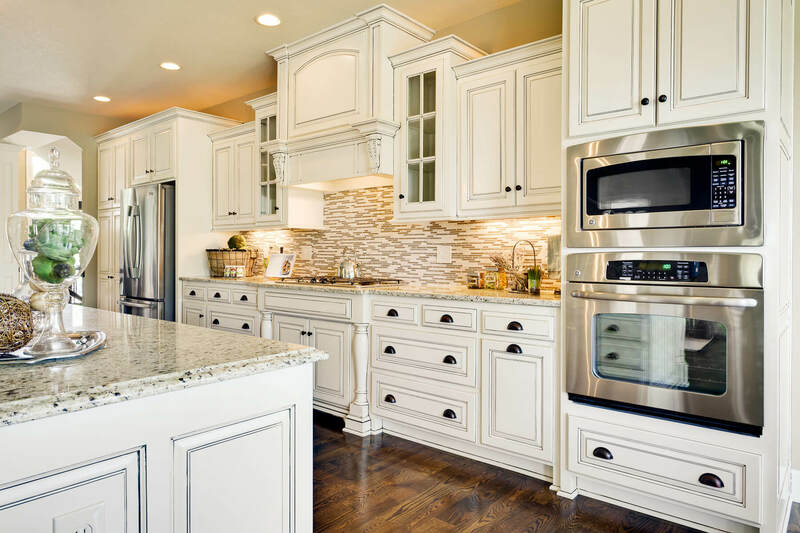 Appliances, finishes, cabinets, counter tops and other elements should be well planned and be chosen carefully. Think of the options that bring convenience to the kitchen and have a good cost-effective, especially in the long term.